Fabs Safaris differs from your average scuba diving trip as we are free to conduct all our dives on our catamaran allowing us to explore some of the remotest diving areas the Caribbean has to offer. We have 6 Mares Vectra Buoyancy Control Devices (BCD’S) and 6 Aqualung Calypso Regulators for course use and for hire. We have 70 kgs of dive weights onboard and 6 weight belts. We also have 6 underwater dive torches for night dives. We have a few spare masks and fins, however we recommend that you bring your own mask, snorkel, fins and wetsuits so as to guarantee a good fit and comfort in the water. On Board Vaza Vezo we are equipped with two Bauer Junior II Compressors, one electric and the other diesel. 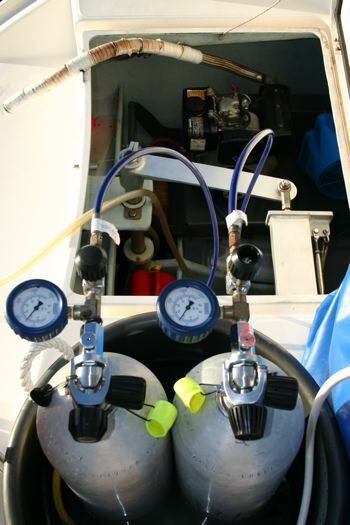 We carry sixteen aluminium 12 litre tanks onboard in our customised dive tank racks. Example hire prices per day in £ GBP. Please speak to us to arrange a special price for a week’s hire or more. We are also a member of ASSET (The Association Of Scuba Service Engineers & Technicians).